Those are good points. Having a proper reason for the stronghold to exist and tying it to the land, definitely adds to the game in terms of suspension of disbelief and lore. Putting the stronghold in the game just because it is on a list of stretch goals to be implemented and not putting any proper design effort into it would detract a lot from the experience. 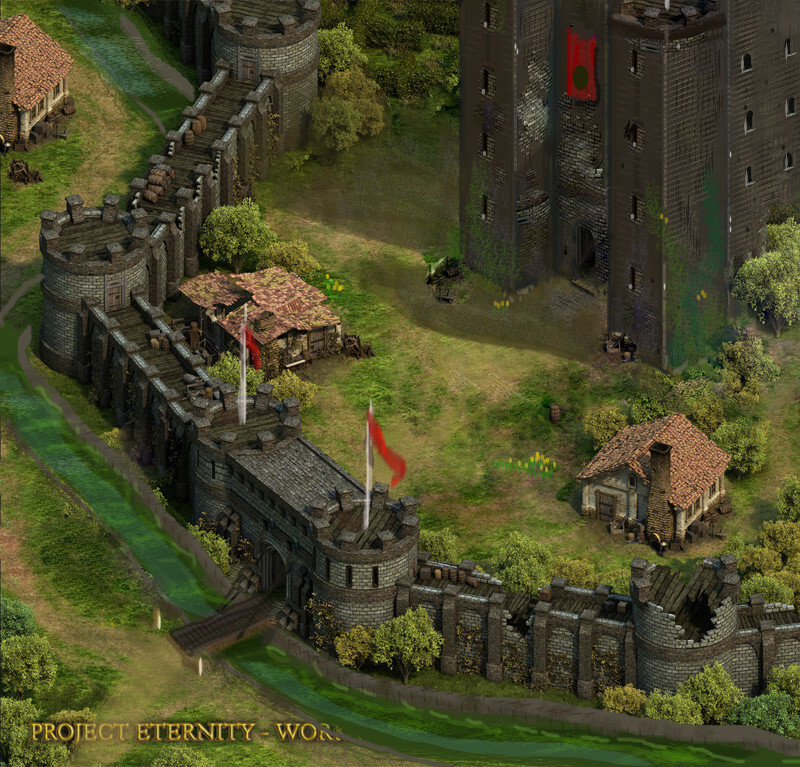 Having the stronghold events reflect the original purpose of the stronghold would also deepen immersion and also allow the player to feel more connected to the lore and the world, in my opinion. However, I don't think it's fair to say based on two WIP screenshots alone that Obsidian haven't taken these concerns into account and I hope/trust they have. I also agree with Posbi and Solviulnir that the insides of the stronghold are a little lacking, though. I'd think that a stronghold would be more densely filled with buildings and other structures, since it can't be cheap to build such massive walls and space should be at a premium. Well, I do admit that my criticism is based on what little we know/have been shown, so there's a chance the final product will look differently. But I do believe that, given the level of maturity of us players and of the game itself as Obsidian envisions it, the points both Solviulnir and I have raised deserve to be addressed. As is, both the D'Anise's castle (BGII) - limited as it was - and the Crossroads Keep (NWN2) make far more sense from a meta-perspective than what little Obsidian has presented to us. Just to make this clear: I don't expect our stronghold to be a carbon copy of the Krak des Chevaliers. But a stronghold - ingame and outside - follows a certain logic, and the glimpse we've been given really shows none. 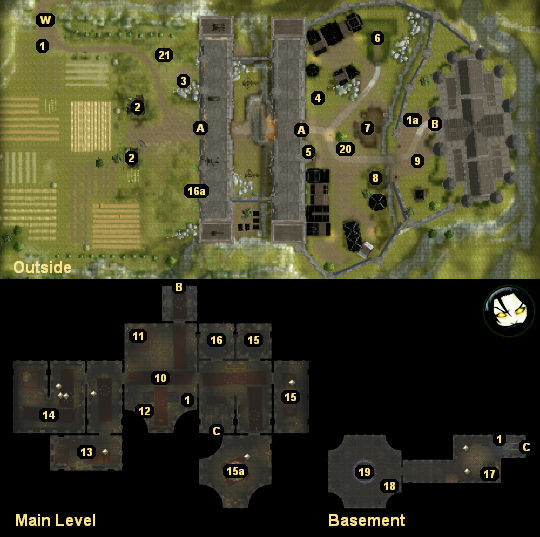 This here, for example, would be a decent player stronghold in opinion. It's got the military aspects, it sticks to features of the landscape, it's got ample space without being wasteful, it's not too expansive, it offers enough choices for ingame construction (you could, for example, just start with the ruined main tower and expand from there on), it's got agriculture, a nearby river, the possibility of a village etc. Edited by Mor, 05 December 2013 - 07:17 PM. Good points, Posbi, but it seems you didn't take time into account. The walls could be from a different time than the houses inside. There could have been a town outside and more buildings inside, but they could have been razzed in a war or burned by a fire. Someone else could have taken over an essentially abandoned place, a nobel with just enough money to build a country house (which by the way is only seen partly and could be a lot bigger) and enlist a few peasants for the growing of food. That the placement of the peasant huts and the amphitheatre seems so random is a valid point though. At least a noble would make sure that there is a clear path from the wall entrance to his front porch and not an obstacle littered maze of huts. And the amphitheatre directly behind the wall entrance is especially bad. "The English country house can be vast or comparatively small and of great or little architectural merit." If Obsidian produces a good backstory for their stronghold I would have no problem accepting the design. I wouldn't be sorry though if they changed it to something needing less explanation ;-). Edited by jethro, 06 December 2013 - 03:41 AM. Again, it comes down to what the stronghold's ingame meta-function was and how it came to be. Problem is, we only have that one small comparison shot to work with. As for the pictures I posted: their main point is to emphasize that function defines form. Ironically, that fact devalues your images to a great degree. Or rather, they make my point rather than yours. Their form follows their function: temporary defensive retreat (Irish ring fort), noble seat of power built back from medieval fortification (French chateau) and private seat of a noble family (English country house). To elaborate on this, our screenshot isn't the first as part one seems to indicate its elements have been there, together, and only fallen into ruin. It's not the second, as that'd mean fewer outer defenses/old castle structures refurbished into a renaissance chateau. And neither is it the third (there the maze would fit, but the outer walls wouldn't). But, okay, I'll stop here. I feel I'm splitting hairs here over something we actually seem to agree on: the stronghold should make sense ingame, right? And to that end what we've got is far from perfect so far. As for keeping it modest, I do agree with you in principle, but the castle I posted and Mor reposted? That is a pretty modest, standard, lower tier noble, medieval castle. For more examples, take this link here (it shows all castles in my home state, separated by counties; the main menu should bring you to a national and Europe-wide listing ). It's in German, but there are pictures and layouts for many of them. Another one is The Castles of Wales (in English). You'll see that most high medieval stone castles are either as large or substantially larger than the example I posted. Edited by Posbi, 06 December 2013 - 03:51 AM. To elaborate on this, our screenshot isn't the first as part one seems to indicate its elements have been there, together, and only fallen into ruin. I'm not contesting that they fell in disuse together. The question is whether they were built together. And I fail to see how you can determine that from the picture. Most castles and country estates are conglomerates of parts built in different centuries. Quote wikipedia about Castle Heidelberg: "The earliest castle structure was built before AD 1214 and later expanded into 2 castles circa 1294; however, in 1537, a lightning-bolt destroyed the upper castle. The present structures had been expanded by 1650, before damage by later wars and fires. In 1764, another lightning-bolt destroyed some rebuilt sections." castle built with walls ----> war,razzing, disuse ---> changed into a country house by a lower noble, walls repaired ------> disuse ---------------> now. Your example links point to castles, and to my knowledge castles were unbelievably expensive in medieval times. Kings or Dukes could build them, lower nobility surely not. A king could also give a small castle as a lease to someone deserving or to a knight to make some border safe. Burg Oesterode (your modest castle) is small compared to Castle Heidelberg for example. But the black and white seems to understate the size a bit. Look closer and you see that it is surprisingly large, especially compared to anything "not-castly" built in the 12th century. It was built by a king and kings lived in it. I'm no expert and I could be totally wrong, but that doesn't look like something a lower noble could have built. Depends on how the actual idea of country houses fits the setting. As far as my understanding goes the idea of the country house, IRL, came up when castles in general had fallen out of style due to their limited value against "modern" firearms and their lack of comfort. But that was from the late 1700s onwards, not the early Renaissance-setting of Eternity. But that's just me nitpicking. I do agree with you that I'll generally be fine with whatever they come up with as long as it makes sense in game. The majority of the stone castles linked there were actually built by simple knights and lower nobles, for example counts. Sometimes very quickly, sometimes over dozens of years, with them being expanded/adapted by following generations. Which wouldn't be the worst template for the player stronghold. I initially suggested a simple ruined tower keep as an all-round solution. That'd allow for modest expansion without going overboard, and other elements like the maze could be placed in nearby woods. I suppose what I'd like to see is a more "organic" approach to the stronghold idea. As for the rest of teh castles, they indeed were erected by the prince electors or on order of the King. Don't know how the majority of the Welsh castles came to be, though I suppose that significantly more were constructed by or on the order of the English crown and the Welsh princes fighting them, with wooden moats being more often used by lower nobles than on the continent around the same time period. The thing is, that type of stronghold (a starfort, I believe) only became fashionable once (comparably) long-ranged and powerful artillery dominated the battlefield. It dates to the times when individual nobels really no longer had the personal power they might have held in prior centuries. Sure, a noble would be in command there, but it would be as little his stronghold as the Pentagon is owned by the highest-ranking general there. Different time, different social functions I suppose. But I'm very glad you bring up these points. Best way to spot the flaws in my arguments, and arguably the best way to discuss means to make the player stronghold a better concept. Add: I think it's worth discussing these points since they mainly concern cosmetic issues of the game, or partially issues with player immersion. That means the underlying concepts to make individual aspects work (the maze, the forum, etc.) aren't affected by any possible change in the visual design. It's better for us and for Obsidian if issues that are brought up can be corrected (if so wanted) with a comparably small effort. Like I said before, the current stronghold looks like an early concept art i.e. to show us how it will work the two states for buildings ruined/rebuilt and present some of the "features"(building) of the stronghold. If that all it is then fine, otherwise it looks like a walled in collection of loosely related building, not somewhere people would live. Remove most of the houses add spread around a Forum, Hedge Maze, Botanical gardens and huge expansive wall and not so much... Like I said from the start, I am pretty certain that is an early concept art, it certainly lacks a lot of elements and I am hopeful that in the final version it will look more functional and alive. Edited by Mor, 06 December 2013 - 05:50 PM. I don't really think Obsidian will change the stronghold apeareance too much and deviate siginficantly from what we saw in the released screenshots. Maybe it's too late, maybe it's too much work for the graphics dept. at this point in the development cycle. But it's important to try and provide some constructive critique and feedback - maybe the devs will say "hey, that's not a bad idea, let's note that down and implement this stuff in the add-on or future update". Thing is, Hector, Kaz and Polina are jaw-droppingly awesome at what they do. And as pros, I'm sure they welcome all kinds of creative and reasonable input from the community. And that's what we do - just throw ideas around, brainstorm, come up with suggestions with the hope that maybe some of them will prove of some use for the devs and make PE even better. You don't need to change it too much, only fill it up a bit(even if you double up buildings or leave some in ruins) and move things around so the layout looks like it has more purpose. Other than more living houses maybe a blacksmith? stable? a farmland outside? don't waste a huge space on a botanic garden put it behind a house. Everything else will be taken care off in the last pass when the fill up the inside with as much details as the walls. ... and asking where all the houses and people and other buildings are. Here on the left original, on the right my edit(sorry for my meager pain.net copy&paste skill). I added couple of houses to make it feel like its more than just huge utility lot for your skill training buildings. I cleared the road from the gate to the manor house and added a clearing in front of it(there is always a town center of sorts). On the main path you got all the daily/main buildings, the forum and three house "hood" where you can have your craftsmen(blacksmith working in the yard? ), behind you can have a horse perches(? the thing you tie horse to) and wheat stack. Bellow in the unused space near the wall I added another house maybe a guard house. You can put the Botanical gardens near and behind one of the houses, no need to take a full lot for it. Edited by Mor, 06 December 2013 - 10:04 PM. He also said that lower nobility could and did erect castles as well, for example if they had the luck of profiting from a trade route or natural resources. He also did rate Castle Oesterode as a small castle, but as too big to just give to some low level adventurers. Sure, we don't know the full design. But that's hardly a reason not to critique the flaws in the design we do know. Yeah, the moat sux quite royally, but it's just to visualise an idea for discussion purposes. You know, that's pretty awesome. Nice one, Solviulnir! Funny thing though, now that I rearanged the area within the walls I kind of understand the logic behind Obsidian design. When there's just one huge fortified building that takes up so much space, there's really little you can do to to represent all the promised "components" of the stronghold. I.e. I see how they needed to cater for the needs of many e.g. botanical garden/maze/forum etc. There needs to be place for all that stuff and all of it is equally important as some people will have fun growing poisonous plants, others hone their stealth skill in the maze (?) etc. etc. The way I visualised it, imho only the warrior type character would be happy with it. So yeah, while I still prefer Friendly Arm-ish look to it, I have to admit that Obsidian did a very good job arranging all the "stronghold" elements in such a fashion so that all are given their respective space. Well, ironically the only counter I've got to that is that we've only seen a small glimpse of Obsidian's stronghold design, and that purely from a meta-perspective it'd make sense to place some elements differently.